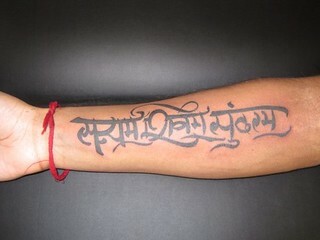 Photo of a sansrit tattoo design I created for a client. I get a lot of requests from people who would like to use this very same design. Most of the calligraphy tattoo commissions I receive are for phrases that have a personal meaning to the person who made the request. For this reason I discourage simply copying an existing design. My rates are fairly reasonable, so I recommend anyone who wants a tattoo to contact me directly and get an original design that has personal meaning for you. Custom calligraphy designs can be ordered by going to my Palmstone website.